Our entertainment picks this week include “America’s Got Talent” Live and The Original Wailers. This year’s Las Vegas shows promised to the winner of the NBC talent contest offer only three finalists. 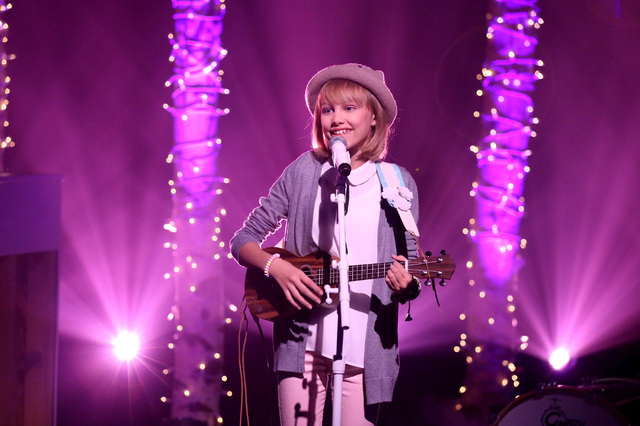 But that’s all you need when the winner is the show’s most popular in years: 12-year-old singer and ukulele strummer Grace VanderWaal. With her are the far more Vegas-typical variety acts Tape Head and The Clairvoyants. See them all at 7:30 p.m. Friday through Sunday at Planet Hollywood Resort. Tickets are $55 to $185; call 800-745-3000. You think of summer for reggae, but October can drum up even better outdoor weather in Las Vegas. There have been a few versions of The Wailers since Bob Marley died. This one, The Original Wailers, is fronted by his “Natty Dread” lead guitarist Al Anderson. The rasta vibrations begin at 8 p.m. Friday at Topgolf Las Vegas. Tickets are $20 to $35; call 800-745-3000. Remember in college when someone always came to the Halloween party in street clothes as “a college student”? Well, you can say you are Gavin DeGraw instead, or just go see him if you opt for normal on a big pre-Halloween costume-party night. The nice-guy singer-songwriter teams with Andy Grammer and Wrabel at 8 p.m. Saturday in The Chelsea at The Cosmopolitan of Las Vegas. Tickets are $27.50 to $67.50; call 800-745-3000. “What were Loverboy’s hits? I know, they did ‘Some Like It Hot,’ right?” Wrong, and right. The Canadian rockers celebrate their 40-year resiliency with a couple of new singles, including one with that name, which is not the song you’re thinking of. But they’re “Working for the Weekend” too at 8 p.m. Friday at the Golden Nugget. Tickets are $53.41 to $216.91; call 866-946-5336. Stay up late. Or don’t. Greensky Bluegrass — acoustic instruments played with rockin’ jam-band energy — get a late start Sunday night with an 11 p.m. show at Brooklyn Bowl at The Linq. But then they tumble out of bed — unless they just stay up — and play a 2 p.m. Halloween matinee as a benefit for the Waterwheel Foundation. Tickets are $27.50 to $35 on Sunday, $22.50 to $27.50 on Monday or $50 for both. Call 702-862-2695.